Jesus and his followers sailed on across the lake. They sailed to the area where the Gerasene people live, across from Galilee. When Jesus got out of the boat, a man from that town came to Jesus. This man had demons inside him. For a long time he had worn no clothes. He lived in the caves where dead people are buried, not in a house. The demon had often seized him. The man had been put in jail, and his hands and feet had been tied with chains. But the man would always break the chains, and the demon inside him would force him to go out to the places where no people lived. Then Jesus commanded the evil spirit (the demon) to come out of this man. The man fell down before Jesus and shouted with a loud voice, "What do you want with me, Jesus, Son of the Most High God? Please, don't punish me!" 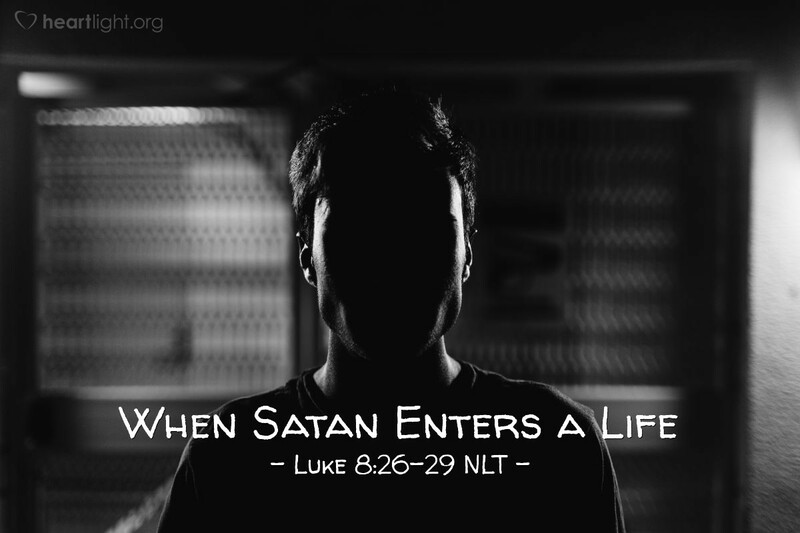 Never lose sight of the underlying truth in this passage: when Satan enters a life, this is his ultimate goal—isolation, self-inflicted pain, anguish, death, and loss of human identity. While temptations are presented as alluring shortcuts to things we want, the evil one uses them as traps to ensnare us and deceive us into letting him take control. His control comes at first, with a host of pleasures. In the end, however, they lead to all that we see in the man in today's passage. Remember this man the next time temptation knocks. Understand, this is Satan's desire for you, and surrendering to his power through sin is the open door for him to come in and take control. Father, open my eyes so that I am not blind to the deceptive tricks and the alluring temptations of Satan. Banish him, I ask in the mighty name of Jesus, from any control in my life. Remove, through your Holy Spirit, any broken and mangled thinking that sin's residue has left in my life. Keep me in my right mind and give me a pure heart to distinguish your truth from Satan's lies. In Jesus' name. Amen.